Funeral homes and cemeteries use many products to help grieving family members when a loved one passes away. Since 1998 our line of Temporary Grave Markers have been used by death care professionals to help these families locate new burial sites until a permanent marker can be installed. Made from high impact polymers and galvanized steel rods, our markers are built to last and easy to use. Use your computer to print out a custom label that contains more than just a name and dates. Add company names, burial locations, even add color and logos to the marker! You can see the variety of logos we offer in our Free Marker Starter Kit. * Easy To Use - create labels in minutes. 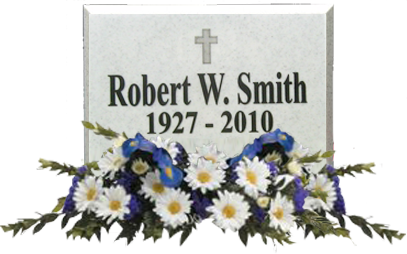 * Custom Designs - Use your computer to change fonts, add color, even scan and print pictures of the deceased (XL Plaque only). 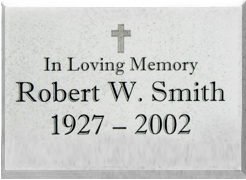 * Convenient - Adding grave location information to the marker is helpful to cemetery/monument employee's.